The Pacific Northwest was having an unbelievably nice pre-summer leading up the the June VHF contest. The weather held for the contest–no rain, not too windy, and a few clouds to keep the sun at bay. It was a spectacular weekend to rove around western Washington state. The route followed the same general pattern and most of the same stopping points I used last June, last September and last January, starting out in Ocean Shores, WA near the CN76/CN77 line on Saturday morning, and working my way to the CN85/CN95 line on the Columbia river near N. Bonneville, WA, and then to a motel in Centralia, WA for the night. Sunday’s route went from Centralia to Mowich Lake Road near Carbonado, which permits me to hit CN87 at 2,160′, CN86 at 3,000′ and CN96 at 3,100′. One difference from previous contests is that I stopped at a new location on the side of Tiger Mountain (1,450′) for the CN97 stop. Then off to CN88 at a school parking lot (400′) in Lake Stevens, capped off by a trip up Mt. Pilchuck to about 3,000′. The equipment list was quite similar to what I’ve used in recent ARRL VHF contests, but configured slightly differently. Three rigs took care of SSB and CW on the four bands a limited rover is allowed. A Kenwood TS-480 served as a 6m rig and as the IF rig for a Elecraft XV222 transverter for 222 MHz. Two meters and 432 MHz were each handled by an FT-857D. For FM simplex frequencies there was an Alinco 6m FM rig, an Alinco dual band (2m/440 MHz) FM rig, and a Jetstream 222 MHz FM rig. Yep…I was juggling 6 mics. One FT-857D head was suction cup-mounted on top of the dash, and the other FT-857D head and the Kenwood head were mounted on the center console using spring clamps on the ash try and cup holder. The two HD-73 rotor controls were were powered by a 600 watt inverter. Two RF Concepts and two TE System bricks brought power up to near the maximum allowed for a limited rover on the four SSB/CW bands. For this contest I added a Mirage 2512G 100w 222MHz amplifier to bring the Jetstream up to almost 100w. Given that most QSOs on the 222 MHz band are on 223.5 MHz FM, it seems prudent to add the extra 3db from an amp. As in past contests, a dash-mounted cell phone provided a 24 hour clock for (paper) logging, and a second cell phone displayed my current grid. A TomTom GPS had all wayponts entered and each day’s route pre-programmed. Other pieces of equipment include a K1EL Winkeyer loaded with CW macros, a N8XJK Super Booster, a fancy homebuilt antenna switch, and a low-tech 3-position switch to switch the CW paddle between the three CW-capable rigs. For 222 MHz, a cross-over switch switched the transverter and FM rig between the front and rear antenna. Mag-mount whips were used with the 6m, 2m, and 440 MHz FM rigs. Following a three hour drive, I arrived in Ocean Shores a few minutes before the start of the contest. After a handful of QSOs on 2m and up, it became apparent that there was a modest 6m sporadic E (Es) opening to the south. That was good for a couple dozen QSOs—CW and phone—before the opening fizzled out about 45 minutes later. After running the bands with a couple of folks, I moved 1/2 mile down the road to a new CN77 spot. My previous CN77 spot was an empty lot that now has a new home built on it. This new spot is a narrow strip of wooded land with tire tracks leading to the water’s edge and an official-looking sign saying “No Overnight Camping”. Fair enough! The only tricky part was parking where I could deploy and then rotate the rear antennas without interference from trees. 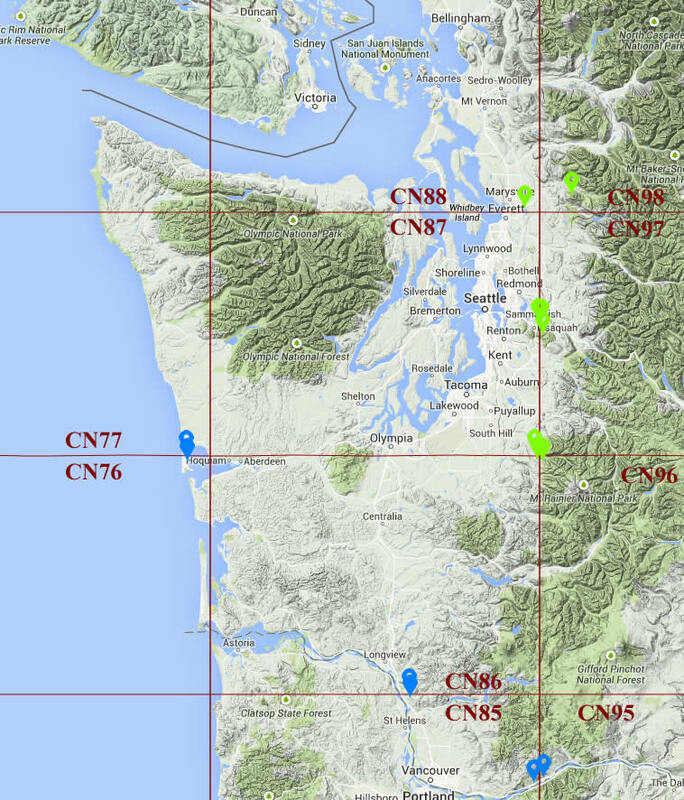 The grid yielded plenty of QSOs from CN85 (Portland area) up to Canada, including VE7XF (CN89) and KE7V (CN88) who were both on the opposite side of the Olympic mountains from me. On the way out of Ocean Shores, I swung back through CN76 to fill in for a few missing QSOs. I also took a small detour through the SW corner of CN87 to work KF7PCL (CN76) on three bands. We had intended to do the same thing once I hit CN86, but we got delayed until I got too far away to work him en route. Fortunately, we were able to complete those QSOs when I was back in CN86 on Sunday morning. At this point in the contest, I had a two hour drive to the CN86–CN85 border near Kalama, WA, traversing CN86 and a bit of CN87. This area is typically an RF dead zone for me, but I managed about 9 QSOs per hour this time. All QSOs were regional. There was no sign of Es activity. My destination was part way up Green Mountain at 1,687′ in CN86. This location has excellent reach back to the Puget Sound area and into Portland. The biggest problem is avoiding QRM on the calling frequencies. With revised contest rules that allow for spotting and using spotting information, I found less of a need to hang out on calling frequencies. I found that if I, say, announced on 2m that I was going to 50.160 MHz, I would sometimes have a sustained run on that frequency. In the past, calls would dry up quickly using the same strategy. Clearly, I was being spotted and that was drawing additional stations to the frequency. The next stop was the other side of Green Mountain on a property owned by a friend in CN85. This has even better reach to the south (Portland and beyond) and does pretty well back into the Puget Sound area. One of the fun things that happened in CN86 and CN85 was multiple QSOs with three different Oregon rovers: Steve, KE7IHG/R, Mark, KE7MSU/R, and Matt, KG7UDH/R. The last stop of the day was N. Bonneville, WA, along the Columbia River in CN95. This grid typically only provides QSOs into CN85. This time, a few CN84 stations got through. I worked KE7IHG/R (CN85) on 6m and KE7MSU/R (CN84) on both 2m and 6m. I left N. Bonneville around 10pm local time, with a two hour trip north to a motel in Centralia, WA. When I got to the motel, I learned that the room they reserved for me was a smoking room. That wouldn’t work for me, and there was no other room available. I was still wired from the day (and from drinking coffee), so I decided to push on for another 90 minutes to my own bed. Kathy was out of town this weekend, so I wouldn’t disrupt her with a late arrival and early departure. And I would be able to stock up with fresh coffee in the morning. I was slow to get started on Sunday morning, but there were QSOs aplenty en route through CN87, which would save me time later on. As usual, the CN96 spot on Mowich Lake road was extremely productive. I was able to work Gary, WA7BBJ/R, in CN77 on all four bands. I frequently activate CN77, but rarely am I able to work the grid. I also worked Tymm, AL1VE/P on Quartz Mountain on 6m, 2m and 432 MHz. Moving back into CN86, just down the road, I repeated the QSOs with WA7BBJ/R and AL1VE/P, but this time I worked Tymm on four bands. A quick swing back in to CN96 let me fill in a few missing QSOs. The last stop on Mowich Lake Road was in CN87. The whole time I was on Mowich Lake Road, there were hints of Es openings, but I was not able to work anyone out of region. It’s too bad…the three stops on Mowich Lake Road have been excellent locations for Es openings in past contests. CN97 was the next stop. This was a new location for me, just off a street on the west face of Tiger Mountain at 1,461′. This location was awesomely productive regionally. Unfortunately (for me), there was an Es opening that was completely blocked by the mountain. I could hear XE2CQ faintly and that was about it. No complaints, though; in some past contests, I’ve been quite lucky to be in the right place at the right time. Perhaps I should consider more open locations during Es season. The next grid, CN88, was mostly done from an elementary school parking lot at 429′. The grid was moderately productive, although I wasn’t able to make it into CN85 as I’ve done from this location in the past. Oh well. At 00:10 UTC (right on schedule) I started out for the last grid, CN98, on the west face of Mt. Pilchuck at 3,000′. This is always a productive location that takes well over an hour to get to. The exact timing depends on how bad the logging road is for the first 5 miles until it becomes paved–they were bad this time. The low-hanging branches necessitates lowering the front antennas to prevent damaged. Once I arrive, the location is always fun because my signal is good signal everywhere. Everywhere except locations back east via Es openings, which I believed happened. On the other hand, I happened to catch WA7BBJ/R circling through four grids around the CN88/CN98/CN87/CN97 intersection, and worked him on 4 bands in each. That’s always satisfying. Activity in the Pacific Northwest seemed up for this contest. There were lots of new calls, and a good showing of rovers. The score is very similar to my 2014 June preliminary score that produced 681 pts × (50 multipliers + 10 grids activated) for 40,860.